A runny nose is only one of the many symptoms that may indicate a baby allergy. If your child has red, itchy eyes, rubs their nose often and when you wipe their nose the discharge is clear, these are other indicators of an allergy. Typically children do not show signs of outdoor allergies until the age of three. Though indoor pollutants such as mold and dust may affect children as young as six months. Here are some steps to help prevent baby allergies in the home. Watch when your baby experiences symptoms the most, excessive sneezing or fussiness because of itchy eyes, etc. If they exhibit heightened symptoms while in their crib, the culprit may be dust mites in the crib bedding or dust or mold in the nursery. A thorough cleaning may reduce allergens in a specific environment like the baby’s room. Dust everything, including normally unnoticeable areas like the blades on a ceiling fan, vents in the room and the tops of door sills. Also look for signs of mold, possibly around windows where moisture is getting in. Replace crib bedding with hypoallergenic mattresses and sheets. Run an air purifier in the nursery. Check out air purifier reviews to find the best one for your needs. However, a HEPA air purifier is key for cleaning indoor air, capturing most airborne particles including allergens. You may also want to get one that has a carbon filter for odors, a nice feature for diaper changes. Many air purifiers like the AeraMax Baby Air Purifiers have extra quiet performance so as not to disturb babies as they sleep. VOC-free paint. VOC’s, or volatile organic compounds, found in many house paints continue to release fumes even after the paint dries. Choose an interior paint without these harmful additives. Solid wood nursery furniture. Engineered wood, wood finishes and upholstery materials can release potentially harmful chemicals like formaldehyde, which is often used as a binding agent. Get solid wood over pressed wood furniture to avoid these harsh chemicals. Organic crib mattresses. 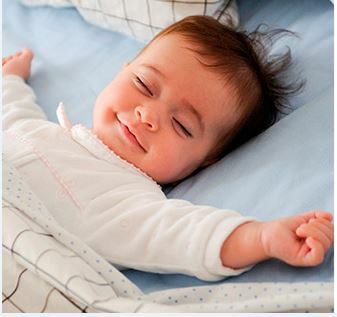 Babies sleep on a mattress for 10-14 hours or more a day during their most fragile developmental years. Get a mattress free of synthetic materials that can release potentially toxic chemicals into the air your baby breathes. Nursery air purifier. Keeping the air in the nursery clean with an air purifier prevents allergens, dust and mold from irritating fragile newborn lungs. Babies breathe an average of 30-60 times a minute—that’s more than double the amount of an adult. With this greater intake of air during the early post neonatal period, the developing lungs are highly susceptible to environmental pollutants. Allergies tend to take us by surprise, especially if we only have spring-related allergies like pollen. Our symptoms subside over the winter and then with the first warm breezy day we start sneezing. Here are some preemptive measures you can take before spring allergy season 2016 takes hold. The dust that has lain dormant over the winter will be whipped up into an allergy frenzy when you open the windows on the first warm day of spring. Do a thorough spring cleaning. Be sure to change air filters in your furnace and clean air vents throughout the house. Bedding can actually accrue pollen and other allergens as you come and go from your home on temperate days. Wash your sheets weekly in hot water to prevent allergen build-ups. This is especially true for pillow cases! Further prevent allergens from following you to bed by showering at night. Pollen particles can cling to hair and skin. Air purifiers are especially helpful on high pollen count days. Choose an air purifier with a True HEPA filter that cleans 99.97% of allergy-causing irritants from the air such as pollen, ragweed, animal dander, and mold spores. Many air purifiers also include a carbon filter for reducing odors, certainly an added benefit. Running an air purifier in your bedroom at night also helps you sleep better. If you do, get one that runs quietly. Also make sure to change your filter regularly. Find an air purifier with a filter change indicator so you don’t have to keep checking. New AeraSmart™ Sensor Technology monitors the air quality and automatically adjusts the fan speed to keep your air purified. Hair gels and sprays are pollen magnets. If you must use hair products, at least rely on step 3 to wash hair thoroughly at the end of the day. Remove Shoes At Home Shoes, like hair and skin can pick up allergen particles that have settled on the ground. Wearing shoes indoors can circulate those particles in your house. Wear Shades Outside Pollen and other allergens and accumulate around the eyes. Sunglasses can protect the eye areas. With winter, indoor air quality worsens, leading to a greater opportunity for colds during the season. Here are some solutions to keep indoor air healthier. 1. Open the windows every now and then. On warmer winter days, fresh air can actually kill germs, flushing them from stuffy rooms. 2. Get rid of poor indoor air quality at the source. Clean air ducts and replace furnace filters regularly to prevent germs from re-circulating throughout your home all season long. 3. Use air purifiers. The best air cleaners can help reduce the cold and flu virus, especially in closed spaces. Air purifiers can also safely remove 99.97% of airborne particles as small as 0.3 microns, including pollen, ragweed and other allergens, viruses, germs, dust mites, mold spores, pet dander and cigarette smoke–all factors that contribute to compromised lung function and make anyone in a winterized household more susceptible to airborne germs. You may want to consider certain air cleaners which feature allergy and flu settings to help during flu season and also allergy season in the spring. It’s also important to know that during cold and flu season babies are more susceptible to the airborne germs circulating in your home. In fact, babies breathe an average of 30-60 times a minute–that’s more than double the amount of an adult. Considering that a baby’s lung are not yet fully developed at birth, and with their faster breathing rate, respiratory illnesses can account for the most health problems among infants. Specially designed baby air purifiers kept in a nursery can aid with reducing airborne pollutants around a young child. You may also want to look for air purifiers that feature carbon filters for odor, and definitely a True HEPA filter to help reduce as many airborne pollutants as possible. Some air purifiers also feature alerts to let you know when it is time to change the air filter, and quiet performance so that you can run your air purifier in a baby’s room or while you sleep without any disturbance. Be sure to choose your air purifier by room size. Some air cleaners are perfect for small rooms. For larger spaces, make sure the air cleaner you choose has the capacity to cover the square footage of the area you want to be purified. If you have pets, you may also want to consider air cleaners that help with pet dander and other allergens that are associated with dogs and cats. You don’t have to curse your pets for your sneezing anymore. Air fresheners by their commonality may seem harmless enough for providing a clean fresh scent indoor scent. 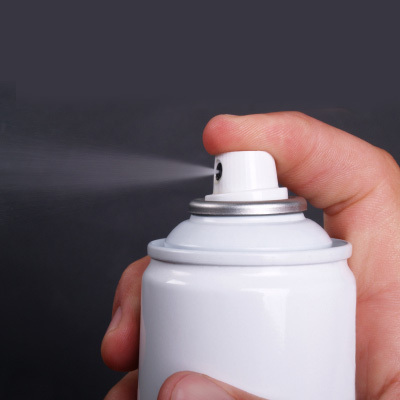 However, in a study by the National Resources Defense Council (NRDC) many air freshener products contain phthalates, hazardous chemicals known to cause hormonal abnormalities, birth defects and reproductive problems. NRDC’s independent testing of 14 common air fresheners, none of which listed phthalates as an ingredient, uncovered these chemicals in 86 percent of the products tested. Houseplants-Scientists funded by NASA say their research shows that plants clean indoor air. These scientists and other vigorous advocates say that plants have been cleaning the earth’s atmosphere for millions of years, why not your indoor air as well? Air purifiers- safely removes 99.97% of airborne particles as small as 0.3 microns! The holiday season is also cold and flu season. We spend a lot of time entertaining and at holiday parties, which means a lot of opportunities for airborne viruses to spread. According to one report, one person sneezing can infect an entire room with Influenza A. This microbe can survive for up to 24 hours and spread to holiday guests six feet away—even without a sneeze to send it along. During the holiday rush, we may forget to keep our hands clean even after simple contact such as shaking hands at the office. Use pocket hand sanitizer to make minimizing the spread of germs convenient. The same can be said for surfaces in our home, especially after someone in the house has already been sick. Be sure to disinfect key germ-carrying surfaces such as the TV remote control and the door handles to refrigerators and microwaves. The impact of an air purifier, even running discreetly in the background of your holiday get-together, can be dramatic. 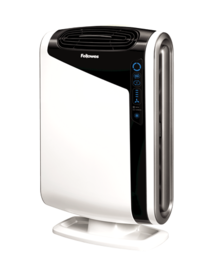 The Fellowes AeraMax captures 99.97% of airborne particles as small as 0.3 microns, which can help clean the air of those stubborn viruses, ensuring cleaner and healthier holiday entertaining.